Central Asia is a land of contrasts. There are inaccessible mountains with glaciers, and vast lowlands with sandy and stony deserts. In the area of about 6 million km2, between the parallels 30 ° and 50 ° N such large Asian countries as China, Mongolia, Afghanistan, Kazakhstan, Turkmenistan, Tadjikistan, Uzbekistan, Kyrgyzstan are located in full or in part. Central Asia historically has always been associated with the nomadic peoples inhabiting it and the Great Silk Road. 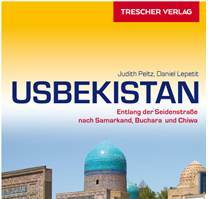 Central Asia – Uzbekistan, Turkmenistan, Tadjikistan, Kyrgyzstan, and Kazakhstan acted as a convergence place of people, goods and ideas from different parts of the Eurasian continent – Europe, Middle East, South and East Asia. The main feature of the entire central part of Asia is its farness from the oceans. For example, from the Tien Shan to the Atlantic Ocean there are almost 3000 km, to the Indian – 2000 km. If there were no mountains concentrated in the east of Central Asia, the entire territory would represent one huge desert. But due to the high mountains there are water resources – glaciers and perennial snow. Going down, the glaciers begin to melt and give rise to rivers. One of the largest mountain systems in Central Asia is the Tien Shan. It stretches from Lake Issyk-Kul in Kyrgyzstan through the territory of China and Mongolia by almost 2500 km. Several dozens of ridges and mountain ranges rise up to a height of 5000-6000 m and above. More than 10 thousand glaciers descend on their slopes. To the east, the mountains gradually decrease, penetrating into the Gobi Desert (the “waterless place”), the largest in the eastern part of Asia. In the mountains of the Tien Shan and the Hindu Kush, two large rivers – the Amudarya and the Syr Darya originate. They flow to the west and, crossing the desert space, flow into the drainless Aral Sea. The Syr Darya, having descended from the heights of the Tien-Shan, flows about 3,000 km along the plain. It supplies water to the Ferghana basin and, once breaking through the Farhad mountains, passes along the eastern outskirts of the Kyzylkum desert. Syr Darya waters feed the irrigation systems in Uzbekistan and Kazakhstan. The length of the Amu Darya, born on the slopes of the Hindu Kush in Afghanistan, is over 2500 km. Coming from the mountains to the plain, it crosses the deserts of Kyzylkum and Karakum, without accepting any inflow. Its channel often changes direction, forming canals and branches. In Amu Darya basin, for a long time there were oases which have been reviving the deserts. To the south of the hillocky area lies the Turan lowland. Its western edge reaches the Caspian Sea, the southern edge – the Kopetdag Mountains, and the eastern one reaches the Tien Shan. It is here that the deserts of Karakum (Turkic, “black sands”) and Kyzylkum (Turkic, “red sand”) are located. The Karakums occupy about 350 thousand km2, mainly on the territory of Turkmenistan. Sands brought by rivers and winds form ridges of from 3-5 to 40-50 m height. They are stretching in the direction of prevailing winds. They are covered by xerophilous bushes and grasses that don’t form a continuous cover. Lowlands are occupied by salt marshes. Their network, similar to the honeycomb, is interspersed with salt lakes. Sandy barchans, on which nothing grows at all, occupy 5% of the Karakum area. For many centuries here herds of sheep were grazed, which finally ate up and trampled down its poor vegetation. At the depth, under a layer of sand, there are ground waters. Few thousand wells and artesian wells have been built in the desert for reaching them. To the north of the Karatau ridge and the Kyrgyz Alatau, where the most important river of Kyrgyzstan Chu river goes to the plain, the desert Muyunkum is situated. Another desert stretching to the north of the Chu River and to the west of the Balkhash Lake, was called Betpak-Dala (the Shameless Plain) by the Kazakhs, referring to the barrenness of this land. The area of Betpak-Dala is 75000 km2. It is the most developed desert of Central Asia. However, when from the Hungry Steppe through a narrow mountain pass a hot wind blows, the “breath of the desert” blasts the crop in the fertile Fergana Valley. The name Great Silk Road or Silk Route was coined by the German historian and geographer Ferdinand von Richthofen in 1877. Until the 16th century the Great Silk Road was of great importance in the development of historical and cultural relations and trade between the peoples of the East and West. It began operating in the 2nd century BC. Long before its formation on the territory of Central Asia and the Ancient Orient already existed routes for trade and economic purposes (“lapis lazuli road”, “royal road”, etc). Central Asia played a significant role in integration of two great civilizations – western and eastern, being a kind of communication agent for both sides. At the same time, the Great Silk Road greatly contributed to the economic and cultural rise of Central Asia itself. In the 13th century, after the conquest of Central Asia by the Mongols, the Great Silk Road slightly changed its direction. After the Mongols the region was practically ruined. Many of the caravans skirted Movarounnahr (ie, Central Asia), passing directly to the Volga River to the north of the Caspian Sea, and from there – to the Black Sea. Central Asia was situated in the intersection of the main directions of this route. Merchants, artisans, scientists and musicians from various countries gathered here. It is known that the Chinese emperor Wu Di in 138 BC sent his envoy Zhang Qian in search of allies to fight against the Xiongnu bellicose nomadic tribes who devastated the northern outskirts of China. Traveling, the ambassador was captured by the Xiongnu for ten years. He could escape and reach the Issyk-Kul Lake passing through the high passes of the Central Tien Shan. Moving along the bank of the Naryn River, he reached the Fergana valley. It was a surprise to him that in the valley there were many cities integrated in one state. He tried to negotiate with the the Fergana Valley ruler. But he agreed to establish only trade relations, and Zhang Qian proceeded to travel further to South. Returning from the journey, he was again captured by the Huns, but once again he escaped two years later. Zhang Qian presented the emperor a detailed report on his stay in Central Asia. In it he indicated the easy ways for trade, which later became the basis of the Great Silk Road. The emperor gave him the title of “The Great Explorer”. The information about the exchange between China and Central Asia is contained, mainly, in Chinese chronicles, since the 1st century BC till the 7-8th centuries AD. Early testimonies tell about donations, which were sent from the Central Asian countries to the imperial palace. At the same time, China also sent gifts in order to win over one of the local rulers. The famous horses from Davan (Fergana Valley), fast-footed racers, which the Chinese called “heavenly”, “winged”, were especially appreciated. There is a Chinese legend. According to it if the emperor wanted to prove his divinity and achieve immortality, he should ascend to the heaven with the help of a team of unearthly horses. It was Zhang Qian who brought “heavenly” horses to China. This adventurous traveler brought from Central Asia not only horses, but also food for them – seeds of alfalfa. Soon, alfalfa crops spread throughout China. Thanks to the Great Silk Road, the peoples of Central Asia got acquainted with the achievements of the economy and culture of the West and East. At the same time, the peoples of the West discovered a high level of development of the Central Asian region. In the 16th century the Great Silk Road ceased to exist. The reason was that the Portuguese found a cheaper way of delivering goods from India and China by sea. Considering the unique role of the Great Silk Road in the history of civilization, UNESCO adopted the program “The Great Silk Road – the Way of Dialogue” in 1987. The main idea of the program is to show how, along with wars, the processes of communication between countries and peoples have been going on for many centuries. The main factors in this process were trade relations and cultural exchange. The result of the UNESCO program «The Great Silk Road – the way of dialogue» was the creature of the International Institute of Central Asian studies in Samarkand, which was called to contribute to the study of the history of the civilization of Central Asia.